We are hosting the Caged Moon Blog Tour today. 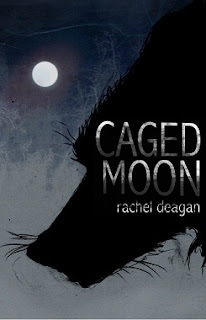 Caged Moon by debut author Rachel Deagan is a paranormal YA with werewolves and shifters. This tour is presented by AToMR Book Tours. Blurb: Haunted by an animal attack, seventeen year old Charlotte feels she is being followed. When she runs into a mysterious boy while camping, she’s afraid. Nothing seems right about him. Despite trying to stay away, there is an unmistakable draw to be near him. Even his scent smells familiar. But the closer she gets, the faster the secrets begin to unravel. Not only is he not human, he may have a link to her past. When Charlotte finds out someone wants her dead, she is torn between love and fear. Can she trust him to keep her safe? Ever since I read Jennifer Lynn Barnes' Raised By Wolves series, I have become a werewolf/shifter fan.What drew me to Caged Moon was its cover. The silhouette of the wolf set against the backdrop of a full moon is extremely cool and grabbed me.Once I sat down with Caged Moon on my Kindle, I was immediately drawn into Charlotte's world. The book's opening scene with our teen heroine going into the woods with her dad to build a campsite--and we know she does not like the woods--quickly drew me into this setting. That same night we find out her inner conflict is a severe fear of anything canine: puppy, dog, wolf, werewolf. Rachel Deagan's writing was clear, precise, smooth and flowed so well I found myself reading the novel straight through in one sitting. Charlotte was a likable character most of the time and her angst was understandable. Her development seemed slow which was understandable in parts but I found I didn't truly connect with her. I liked Liam, the mysterious guy from the woods. His behavior towards her is stalkerish and I was glad she called him on it many times. What I didn't believe was her lack of figuring out what he was before she finally did. Any time a guy kisses you and canine teeth pop out of his mouth your supernatural radar should be working overtime. In that scene the author deftly showed Charlotte's comprehension that Liam wasn't a normal guy and her reluctance to admit to herself exactly what he is was also a testament to her own lack of identity: her reluctance to accept what she was ever since she was attacked and bitten by a werewolf when she was five. The love story did seem formulaic in the speed in which these two fell in love. As a writer I understand the need for speed in YA novels, and as a reader I can become frustrated when these 'quickie' get togethers aren't well explained. I was glad to see Deagan showed us Charlotte's mental reluctance to her growing attraction to Liam and also her body's physical reaction to him whenever he was near her. How her body craved his pine needle scent made their attraction believable. Liam's pack was a nice group of friends, admirable in their loyalty to him, and their scenes offered a lot of humor. Liam's mysterious background came to light as Charlotte was learning about her own identity so the parallel discoveries of identity was a cool factor and really helped me like their story. What I did want to see was more about Liam's background with his own wolf history. The introduction of his leather book was good but the scene between Charlotte and her best friend Ty as they talk about the book's contents was too short. Aaron was a welcome adversary and a nice foil to who the true bad wolf was. Since this is a series I am assuming more about Liam and Aaron will come to light. I was curious about Ty's charm and what it was made of, but I didn't understand why she was wearing it and hadn't told Charlotte about it. Though there wasn't a lot of depth to the characters, what they had at the beginning did change over time by the story's end. Again, with series, we don't always see a tremendous amount of growth in one installment so I tend to downplay this factor when reading paranormal titles. Caged Moon is a fast paced YA paranormal title that grabs a reader's attention and takes them on a trip much like a wolf's run through the woods. I enjoyed the story and expect to read more of Rachel Deagan's future novels. Rating: 3.5 stars. I liked it. Favorite excerpt: "But your mind is still there in wolf form, right?” I asked. “Yes,” Liam said. He dropped his hold on my chin. “The wolf is part of who you are. There are physical differences, but once you both meet for the first time, you become one and the same. The wolf’s instincts and mind are blended and mixed with your human one. As I stand here, the wolf and I are on equal ground. “Does it hurt?” I shifted my feet, my face hot. He paused and I flushed cold. “The first time can be a little painful,” Liam said, his face twisting. “The body isn’t used to the stretching and remolding that is required for the change. During a shift, your skin, bones, and ligaments actually become flexible. There is a chemical reaction that happens in the body making them no longer firm, but tangible. It is how we are able to change physical form without everything in us breaking.” I cringed at his words. “The first time, the body tends to resist the change. It’s similar to the physics notion of a ‘body in rest tends to stay at rest’. After the first time, the body accepts it, and it doesn’t hurt at all. In fact, it’s rather invigorating,” he said with a smirk. “Charlotte,” he said. His fingers found my cheek again. “Do you want to try? You’re safe, here, with us.”"
Cover comment: As I stated in my review, very cool picture. Book source: I received an ebook copy of the book from the author for my honest review during a book tour. About the author: Rachel grew up in small town Massachusetts where she spent most of her time writing about strange paranormal creatures instead of paying attention in class. She has always been considered the ‘dreamy’ one with her head in the clouds. She now lives in Nevada with her two sons, a cat, and a rat named Sam. There is a tour wide giveaway of 1 print copy and 5 ebook copies of Caged Moon or Alpha Moon (winner's choice). Print is US only and ebooks are International. Caged Moon sounds like a fantastic read! Caged Moon sounds great! I would love to read it. New to this author, but your review and the book blurb has me interested. Thanks for the giveaway! Thanks for the contest, the books sound good.